Comets and asteroids have both been eyed as possible progenitors of meteors, also known as shooting or falling stars—and now particles spewed from comet 67P/Churyumov-Gerasimenko have provided proof of paternity. "This paper shows for the first time that the fluffy, dry dust particles of a comet are (the) parents" of interplanetary dust particles (IDPs) which give us shooting stars, Rita Schulz of the European Space Agency (ESA) told AFP. 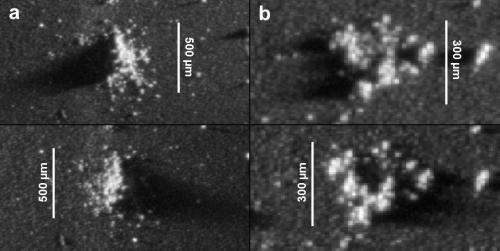 Published in the journal Nature, the study saw ESA's probe Rosetta snare and analyse dust ejected from 67P as the comet raced towards the Sun, hundreds of millions of kilometres (miles) from Earth. Comets are clusters of primordial dust and ice that orbit our star in elliptical circuits. As they near the Sun, melted dust and ice is deposited in their wake as a visible "tail" that disappears from view as they head back into the Solar System—a cycle that continues until the celestial wanderers finally disintegrates. Comet 67P has an orbit of about six-and-a-half years—about four years of each cycle are spent in the cold outer reaches of Space far from the Sun. The comet's most recent switch into active mode was observed from up close by Rosetta since its arrival in August last year to October—orbiting 67P at a distance of 30 km (19 miles) or less. 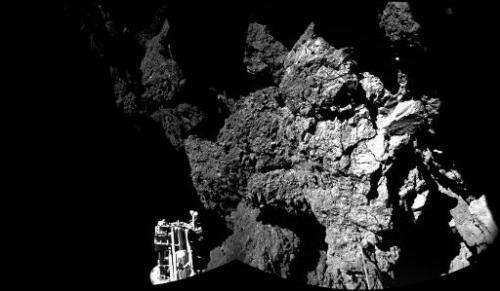 Particles collected by Rosetta's COSIMA instrument during this period, when the comet moved from a distance of 535 million kilometres to 450 million kilometres from the Sun, shattered on contact, said Schultz. The particles were about 50 micrometres in size (0.05 millimetres or 0.002 inches) before breaking. "They are fluffy and porous and rich in Na. (sodium)," said Schulz—characteristics that led the team to conclude "that these particles likely represent the parents of interplanetary dust particles." IDPs, in turn, are what we see as shooting stars if they enter Earth's atmosphere. The study gives important backing for mathematical models of the source of shooting stars. For example, the Leonids, a meteor shower that occurs every November, have been associated with a comet called 55P/Tempel-Tuttle. "There has been a long-standing dispute of whether the source of IDPs are solely comets or also asteroids," said Schultz. "Our results imply that they have cometary origin. Another source would not be required." Asteroids are considered to be far more numerous than comets, but their composition is different. They are rocks, much smaller than planets, which circle the Sun, mainly in a belt between Mars and Jupiter. Comet 67P's outer dust mantle should be entire shed soon, if it has not happened already, said the study authors. As a result, the particles that will be collected for the remainder of Rosetta's mission will have very different properties as the ones used in the study. Rosetta's journey to 67P took more than a decade from 2004 and 6.5 billion kilometres. 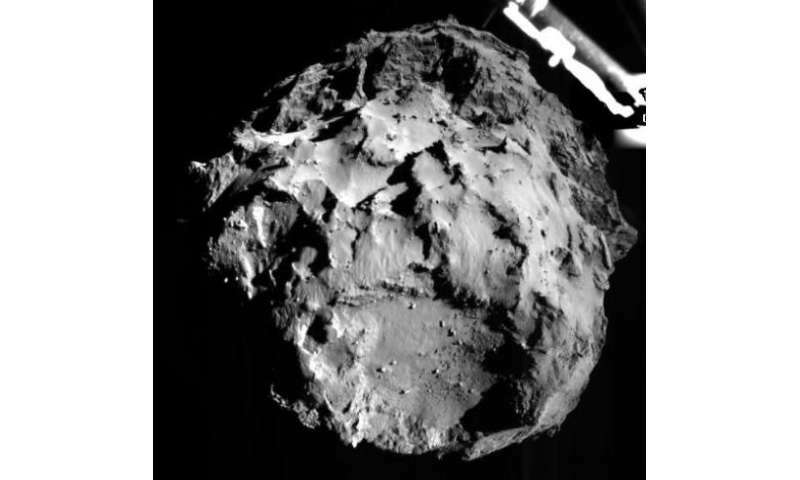 Last November, the craft placed a washing machine-sized robot lab, Philae, on the comet to gather as much data as possible for the 60-hour duration of its onboard batteries. Rosetta will continue orbiting 67P as the comet loops around the Sun, coming to its closest point of some 186 million kilometres on August 13.